In our project space, Patrick Jackson presents Shelving Unit, a freestanding shelf composed of glass and matte black, plastic columns. Each column is shaped like a square morphing into a sphere, set between sheets of glass and alternately rotated, resulting in pillars reminiscent of Brancusi’s Endless Column. 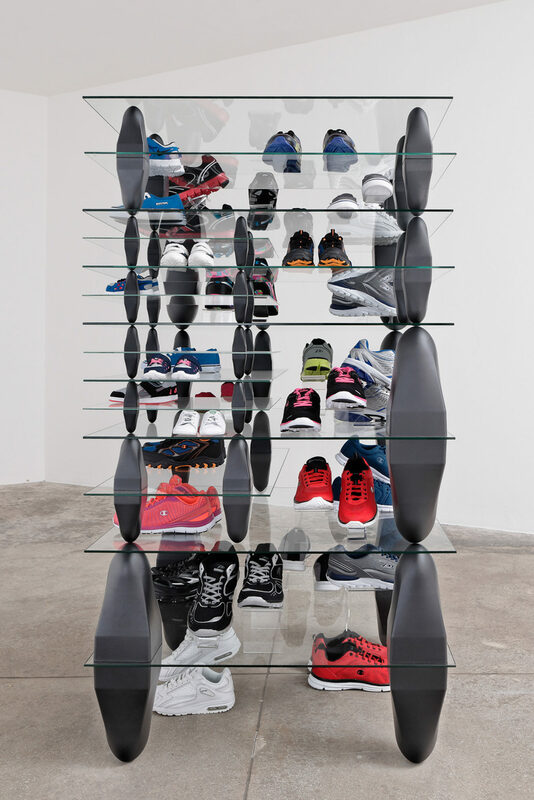 This version of Shelving Unit is stocked with brand new sneakers. Patrick Jackson (born in 1978) earned his BFA from the San Francisco Art Institute (2002) and his MFA from the University of Southern California (2007). He lives andworks in Los Angeles, CA. Working primarily in sculpture, Patrick Jackson had exhibitions in galleries and institutions internationally, including François Ghebaly Gallery, the Hammer Museum in Los Angeles, Nicole Klagsbrun Gallery in New York, The Soap Factory in Minneapolis, and CAPC Musée d’Art Contemporain in Bordeaux.